AMIPIM the world’s leading real estate exhibition and conference brought together the most influential real estate professionals to explore major international property development projects, connect with potential partners, and strike deals over 4 intensive days. 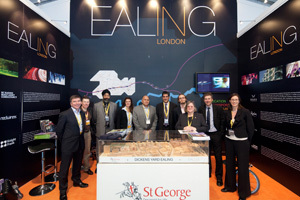 Redwire was a key partner for the London Borough of Ealing over these days. Redwire DC has worked closely with Ealing Council to deliver the scheme, which is well located to support Ealing’s flourishing economy as one of Europe’s largest industry hubs. The founder of Redwire DC is looking to strengthen the relationship further with the Borough through his involvement in a variety of other industrial and residential schemes in the area.